It’s Good Friday now so a short week with just 4 working days. On Monday I took the tram, which has improved in that it’s got quicker over the years. Tuesday was my regular cycle commute which has also improved as a significantly helpful segregated cycle lane has been installed for 1km of my route. The cost of clothing to keep me dry has been spread across 12 years of consistent riding and I’m currently wearing more expensive over-trousers and a light blue Ron Hill running jacket (to be seen but avoiding our current fixation with hi-viz everything) and these items can also be used for my fell running adventures. Seems a bit excessive but I’ve learned that it’s worth investing in good kit once you know you are going to use it regularly and I can ride all year round in absolutely any weather. So Wednesday was the turn of the ‘Express’ bus. In past years I’ve tried local First buses and they deliberately go around the estates of Prestwich and Salford as they head towards the city. Prestwich is on a straight road from Junction 17 of the M60 to Manchester City centre and is served by the x41 and x43 buses which travel down the M66 from Blackburn, Burnley and other places up the valley. They make limited stops from Prestwich (about 1 in 4) and I love to tuck in behind them on my bike when the traffic is moving freely. I was a little late leaving the house so traffic was building after 7:30 and the bus was slower than my bike would have been until we reached the MacDonalds at Broughton. A bus lane enabled us to pass over 50 slow moving cars until we reached Strangeways. I spotted a Mobike and jumped off (maybe a stop to early) booked out the hire bike and then caught the bus up at the next set of red lights. The return bus ticket had cost £5.60 so not much cheaper than tram and with the cost of 2 bike hires at 69p each I would be spending more today. I might have been a bit lazy in asking for a ticket to Manchester which they took as meaning the end of the line, maybe if I’d stipulated Strangeways which would be 2 miles shorter could it have been cheaper? I prefer travelling by on the top deck of a bus to a tram anyway; peering into peoples gardens and noticing things along the route that I never do when driving or cycling. There were seats too; from 7:15 I’ll usually be standing on a tram and these bus seat were leather with extra arm room (only 3 seats wide rather than 4 upstairs) wi-fi connectivity and USB charging points. I guess some travellers would be spending the best part of 3 hours a day on those buses. Upon Mobike #16516, progress along Chapel street seemed laboured for a man of my fitness. I noticed that my knees were nearly hitting my chin because the seatpost had gradually sunk downwards. Despite being only 5’7″ (when stood up very straight!) I need the seat at the highest point on a Mobike to feel comfortable. In the space of 1km of riding with the vibration of the road the seat had slid down to its lowest point. I got off at the junction of Trinity Way and pushed over a short section of pavement to pick up a little side street and then met with my familiar cycle commute route along Ordsall Lane. Bike ride was 4k and 15 minutes so with walk to bus stop and 5 or 6 minute wait for bus the whole journey, despite slow moving traffic on the bus was 50 minutes. Coming home I tried to be clever and it backfired on me. My ticket for the x41 Red Express was also valid for the x43 Witchway and according to the bus company websites they took different routes out of the centre of Manchester. So to find a stop where I could catch either I took a Mobike to Deansgate. I just missed an x43 but an x41 turned up in another 3 minutes and then we queued for 20 minutes to make our way to Strangeways and Bury New Road where we finally started to progress at more than walking pace. I should have cycled to Strangeways and probably would have caught an earlier bus and saved 20 or 30 minutes. So the return took an hour and 10 minutes despite traffic home (without a bus lane) moving quicker from Strangeways than it had in the morning. Thursday I ran to work in 55 minutes. I’ve done this a few times and it’s a great way to get in some of my weekly mileage to enable racing or harder running at the weekend. You don’t have to run, many mornings I see a former colleague walking the 8km from Prestwich to Manchester. He’s no super-athlete and likes a drink which is the medium through which I’ve kept in touch with him in the 10 years since he left Sage. For variety I ran down into the valley to avoid the traffic of Bury New Road and picked up the former Bury Bolton Manchester canal through Agecroft taking me to the roundabout at Pendleton. From there 3km more of streets through Langworthy and picked up pace for the final km down Trafford Road. This was a recovery run for me after running harder the previous evening, and I enjoyed listening to a compilation of mostly 80s Guilty Pleasures (Kid Creole and the Coconuts anyone?) and with nobody else around for most of the route I could sing along too. Shower at work changing into the clothes in my backpack then porridge and a big dirty cooked breakfast for lunch. All earned and very necessary re-fueling! Heading home I took a Mobike to the edge of the hire bike’s zone of operation as they shouldn’t be taken over the Salford border into Bury MBC. I conveniently stopped at the Star Inn community pub which required a short climb up cobbles – a nice little challenge – and then enjoyed a couple of pints of Guinness and a bit of a natter with some local characters. I succumbed to repeated requests to put a bit of PM Dawn on the jukebox and once I’d got a few credits in there Andrew was demanding a Sonia track too. I’m clearly not the only one with guilty pleasures! Jukebox charged and myself refuelled I headed home marching at a bit of a pace with a full bladder. 32 minutes for 4km is quite a pace for a walk. So if you cut out the drinking time then my Mobike and march was just 52 minutes. Cheaper than bus or tram even if you include the price of the first pint. I think I’ve found myself the winning commuting option! After a bit of chat at work yesterday about Andy Burnham’s proposal to give priority to cars commuting with multiple occupancy I went looking for a picture I remembered posting on my blog which had the slogan: “When you ride alone, you ride with Hitler”. It took a while to find as I’ve blogged quite a bit over the years and I didn’t realise it was over 7 years since my last commuting experiment. I think it’s time to try it again as there some new options and I’m sure things have improved as long as you aren’t insistent on staying in your car. Whilst cycling to work it’s notable that Bury New Road is now moving slower than me from about 7:20 and similarly on the “Broughton Cycleway” along Great Clowes Street. More of that later. Yesterday I was taking the tram anyway because an Italian class straight after work made a later than normal bike ride home less appealing and to be honest I could also do my homework on the tram travelling to work: Molto bene! That’s something I couldn’t do by bike although recently I have enjoyed shouting out the numbers on car number plates during commutes (so I’m particularly good at my 50s and 60s). The trams have improved in that they are more regular. The cost has gone up well ahead of inflation (32% in 7 years) and the network is still surprisingly brittle, but when it works it’s quicker than ever. There’s now the ridiculously named “Get me there” Oyster-ish style card for combined mode travel and apps on your smartphone to help avoid dead time waiting for trams. My Monday commute in contained a fortuitous 1 minute change at Piccadilly Gardens and with around 3 minutes wait at Prestwich my door to door time to the office was 43 minutes which improves upon 2010. Today was back to the bike to give a benchmark to the alternatives. I’m more relaxed about commuting these days, it definitely helps your attitude not to be rushing and I’m less likely to be tempted into taking chances. I’ve modified my route over the years to make it safer rather than quicker and my improved over-all fitness means I don’t need to shower when I get to work unless the weather is dreadful (not happened yet this year). It took 24 minutes in today and was a bit wet too but nothing my Inov8 overtrousers and Ron Hill jacket couldn’t handle. My quickest time on a roadbike is over 5 minutes quicker but then I’d need to shower and carry clothes in on my back (sometimes key items can be forgotten!) and it brings extra risk to someone who’s not particularly confident with drop handlebars, cleated to pedals and having to weave super slender wheels around potholes. Ah yes potholes – the one thing that unites car and cycle commuters around these part! So when I’m not reading number plates in Italian or attacking Strava sectors along the commute I sometimes count the number of cars with just a driver in them. This morning, after discounting commercial vehicles and private hire cars, just 11% of cars in my sample had passengers in them and only 1 of those 100 cars contained more than one passenger. Yes I’m sure there are reasons for some why alternatives to driving alone are impossible for some people but surely there’s some room for improvement? I’ve been cycling this route consistently for 9 years, to be honest the last time I was knocked off was at a mini roundabout along an alternative ‘quieter’ route: National Cycle Route 6. With a bit of extra fitness in me the direct arterial route towards Manchester seems safer and particularly the gradual downhill bits heading to the office where I comfortably ride at 20 mph and either match traffic or slow a little to carefully pass queues whilst keeping my eyes peeled. Great Clowes St has had its segregated Broughton cycleway for the last 3 years. The state of the cycle path surface is poor though (parts of it degraded in just weeks) and a number of the posts forming the segregation are regularly broken (and promptly replaced). The path is, however, regularly cleared of debris and definitely gives protection as well as a competitive advantage to bikes using it from 7:30am into the rush ‘hour’. I’ve never had any incident around intersecting bus lay-bys or junctions along the 1km stretch that I use. Prior to the cycleway’s creation traffic travelled along that road in 2 narrow lanes (squeezing cyclists at times) though it was no wider than Bury New Road the parallel trunk road through the north side of Manchester’s city centre. In addition, a couple of weeks ago I noticed the facility below that has been put into Albert Park at the north end of the path: a bike repair stand with tools held in place by cables. I’d not seen anything like it before and although I can’t imagine the stand being used a lot it shows that the Salford City Council care about cyclists. 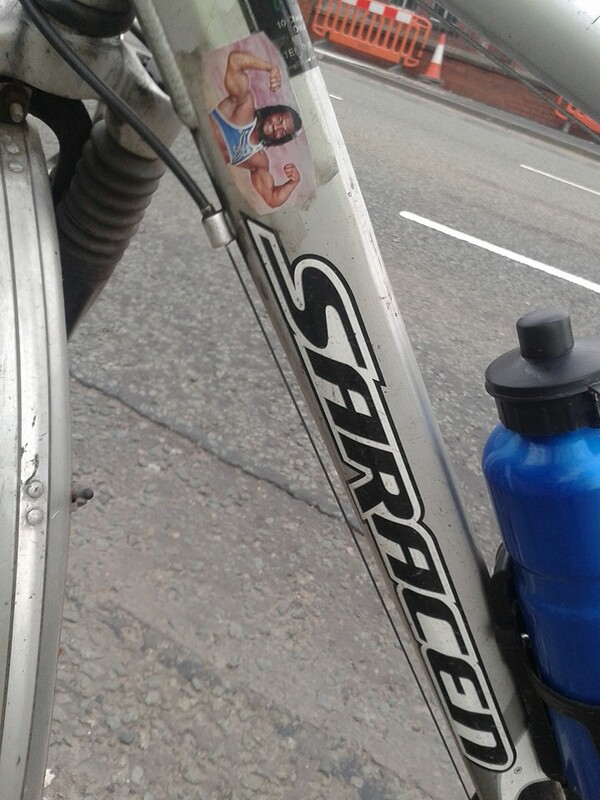 Another commuting pastime through Broughton and Ordsall is counting Mobikes. Today there were 17 and although I admit that none of them were being used each day they seem to be moving around suggesting that they’re used at least once daily. They seem to congregate around student accommodation blocks and since the joining price has dropped and area increased to cover parts of Salford again their numbers on these streets have increased. More on that in the next blog entry. Tomorrow I’ll be taking an ‘express’ ‘bus with its leather seats and wi-fi coupled with a Smartphone activated Mobike hire-bike: 21st century commuting! Then Thursday back to basics as I’ll be running in with maybe a Mobike and walk home. If you’ve had the pleasure of hiring a Mobike you’ll know that the beauty of it is not the quality of the bike but the system around it. Nevertheless, I feel the need to report on the performance of the vehicle and in particular how it functions at the extremes of its remit. Yeah it’s great for pottering around the twin city centres of Manchester and Salford but how might it handle the cycle section of the Salford Triathlon course? I’m sure you’re all very eager to know…..
I’ll blog again about the Mobike system as I’ve had one or two issues in the last 10 days that I don’t want to talk about just yet; I’d like to allow them at least a month to settle down and address the teething issues which it’s only right for them to expect. So a 10 minute walk to find an available bike but I think it was the best of the 6 I’ve ridden so far. A big squeak around the brakes (that were very effective) but I only found that out at the end of 35 minutes of joyful riding. Other than that it was a faultless ride. There’s definitely a whistle that develops as you ride at over 12 mph into a headwind. It reminds me of the sound emitted from a late 1970’s Volvo (possibly the 343 model) but that isn’t a bad thing as it transports me back 35 years to a world of Grifters, Choppers and carefree cycle adventures. So, once warmed up, I set off in earnest from Media City plaza which was the site of the swim to cycle transition zone in my 2013 Salford Triathlon. I headed out towards Eccles and, as 4 years ago, was met with a headwind as I escaped the shelter of the high rise buildings around the Quays. I dutifully stopped at a set of lights before bearing left onto the road that followed the northern shore of the ship canal. As it became more exposed the headwind kicked in and it was most noticeable when climbing over a railway bridge causing the muscles to burn as I tried to maintain a respectable speed. The bikes are heavy and although that gives them a reassuring feel you do notice the weight on any slight climb. I dropped off the main carriageway onto a parallel cycle path which is definitely the natural habitat for a Mobike. I’d covered the first km in 3 minutes – not shabby. I turned left and crossed the ship canal noting the broken glass not swept away from the cycle path but crunching fearlessly through it all with my solid tubeless tyres. I dipped a bit for the 2nd km down to 3mins 22 but that was the climbing and the headwind I’m sure. The descent into Trafford Park was welcome as my thighs were burning, I consistently held 17 mph or so with a few bursts of leg speed like some kind of spin class maniac. Strava, if it is to be trusted, claims I hit 31.3 km/h at some point. Sounds about right, the 3rd km was back to 3 mins and then the 4th in just 2:30 which makes for a 24 km/h average over a mile. Downhill yes, but still but a decent performance – has anyone clocked a quicker Mobike km I wondered? I crossed trouble free over the old train lines running across a road in Trafford Park which I remembered bothering me and causing me to move off my aero bars to the main handlebars on each of the 5 laps upon my road bike after surviving the first lap of the Salford Triathlon. Along the side of the ship canal there was an out and back to Sam Platts which is currently being raized to the ground – a sad sight, even for a City fan. A slight diversion around the Imperial War Museum took me off the original Triathlon course but I don’t think I gained anything. 2:43 for the 5th km and 3:13 after the turn and heading back into the wind. 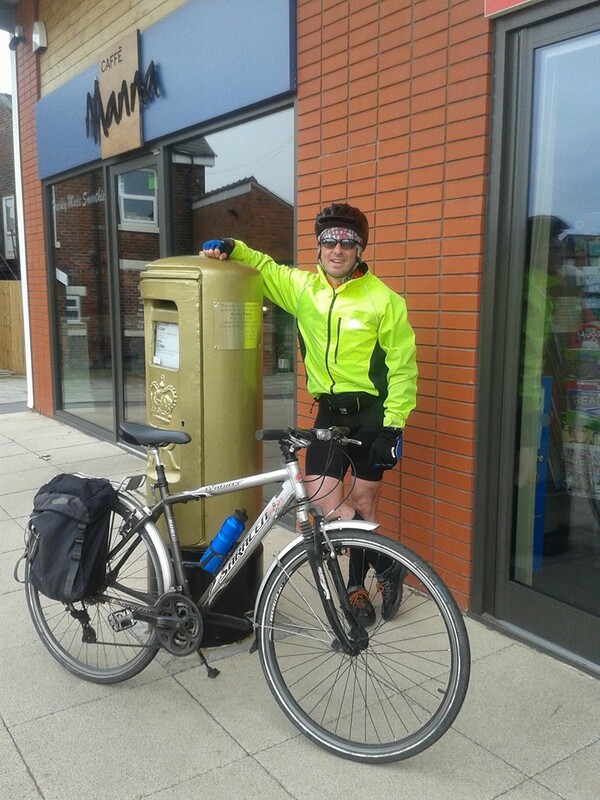 I crossed back over the Media City bridge and returned to Upsy Daisy who marked my start and finish line. Good fun, a great workout, not comfortable but proving to myself that the bike is best suited to 30 mins and 2 or 3 miles rather than trying to do double that distance with silly speed. Manchester and Salford have seen the launch of the Chinese bike hire scheme Mobike this week and it’s got our office talking bikes. This is their 130th city scheme so presumably they know what they’re doing but it’s the first one in this country. Its beauty is its simplicity: Download the Mobike App, enter phone and credit card details to cover a returnable deposit, add some credit for your first ride then away you go. I’ve ridden the Paris, London and Brussels schemes over the last 10 years and unlike those others this one benefits from GPS on all the bikes and is smart-phone controlled removing the need for and restriction of docking-stations. The bikes are secured by a locking ring through the back wheel which is released on booking out the bike. 50p per 30 minutes seems very reasonable. As an introductory offer for this month only the deposit is £29 rather than £49 and it is returnable on leaving the scheme (as long as you returned the bike you used). The area covered is ‘Manchester and Salford’. You can ride anywhere but the bikes must be returned and parked in either of these 2 cities. If we are going off council boundaries I have already picked up one bike in Trafford (returning it to Salford) but unlike many of the other cities in China the app doesn’t show our ‘defined operating area’. People in the office are weighing up commutes and I think it’s better suited to simplifying public transport so you don’t need the cost of tram as well as train or 2 buses. I wouldn’t have the patience to ride 5 or 6 miles home on one. It’s perfect for a 2 mile journey into the city centre for a bit of shopping or turning two 15 minute walks across the Quays and back into a 10 minute round trip with more time for lunch (or beer) in between. I can see plenty of use cases! It’s single speed and geared low which is just as well as it’s quite heavy (making it feel very stable) and on the slightest incline you notice the extra work you need to do. Fortunately there aren’t any significant hills around our 2 cities. There are a number of hubs where the bikes congregate, one of them is 2 minutes walk from the office which is very handy. I expect they will be reallocated as patterns of demand will dictate. As well as looking quite funky, they’re great fun to ride and the whole scheme feels rather playful. The twisty bell is loud and joyous, finding my first bike on Tuesday was like Geo-caching or playing Pokemon Go, and the points based reward system for good behaviour and safe returning of bikes feels like a parental wallchart type thing. Having read the rules I have already broken 3 of them in the first couple of days: Firstly on finishing my ride today the locking mechanism was broken and couldn’t be manually applied. The phone app covered this eventuality and enabled me to notify that I had finished my journey and also report back (with a photo) the problem with the lock. Had I not done this I could have had points removed from my credit rating (currently 104). Second issue was that I locked the bike up outside a popular fast food restaurant with my own lock which is a no-no and if someone had spotted and reported this then I could have had points deducted (bloody snitch!). The final infringement was parking the bike on private property (outside my office door) rather than on a public pavement where it is easier for the bikes to be found and punters don’t have to worry about trespassing. I realised I’d done this on Tuesday and moved the bike yesterday without unlocking it. With the rear wheel secured and I had to lift it and roll it on its front wheel, after a few seconds the bike detected it was being moved without being unlocked and started beeping in distress (stop thief!). I dumped it by the gatehouse entrance to our Quay and scarpered before anyone could see. So it’s easy to use and good fun, once I know the rules I’ll play the game and see if high credit leads to some free trips. It’s notable that unlike the London scheme which has cost over £60m to implement (money well spent imho) the Mobike scheme hasn’t cost us local tax payers a penny. Hopefully this will take off and coverage grows and maybe even becomes the norm for our towns and cities. I’ve recently bought a Trek 7.4 hybrid through the work’s Cyclescheme to replace my default get-to-work-cycling-hack known as The Mighty Saracen. The Saracen isn’t broken but is due its winter service and although I don’t begrudge the amount of money I have spent to keep it roadworthy over the years, these costs have probably come close to 10 times what I paid for it. I didn’t pay much for it though. JP, A former colleague at Sage had sold his 5 year old bike on to me for just £40. I’d had my previous regular commuting Trek 7.3 stolen and after swapping to my mountain bike I’d picked up a puncture within a couple of weeks. The primitive crud catchers were not keeping enough of the Greater Mancunian rain and oil off my clothes so I was faced with spending £45 on a pair of Schwalbe Marathon tyres plus the cost of upgrading the mudguarding system. JPs attractive offer bought me some time to save up for a new bike, this seems to have taken me 4 years. I have tried not to become attached to the bike as I had been hurt by emotional attachment to a previous bike before she was snatched away from me (and never found on that occassion). Up until that point my bikes had been female but I have determinedly referred to the Saracen as an ‘it’ even after adding the image of the very male former Gladiator to its frame. It’s been more than just a commuting bike and we’ve conquered Cragg Vale together as well as going on a couple of epic 100 mile rides to the seaside and back. These were a couple of the Ian Hoggarth memorial rides that I’d completed with colleagues from work. As we were riding to Southport along the Trans Peninne Trail I couldn’t take the roadbike so the Saracen was the best solution my fleet could offer me. 2 careful owners, serviced regularly, a bit scuffed but in good working order. 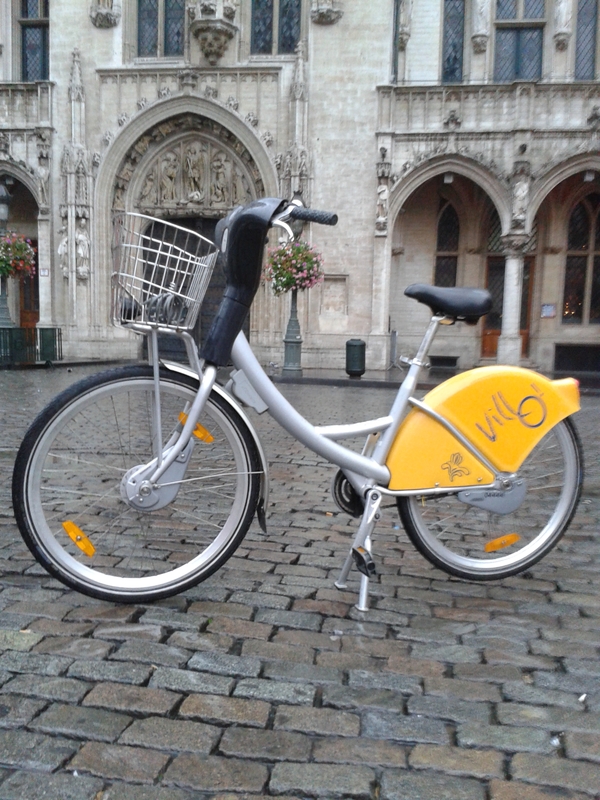 I tried out a Velib hire bike in Paris a few years back and a Barclays/Boris bike in London a couple of years ago so as I was in Brussels for a fantastically beer filled stag party I thought I’d compare their Villo hire bike with the other two. Wherever I am, and no matter what state I’m in, I tend to wake early. It’s when I prefer to exercise as it’s quieter and that time is my own. I’ve run one of my quickest 5kms with 5 pints of Peroni still clouding me and although there’s nothing big and clever about drinking I wonder if my body has evolved to efficiently take these excess carbs and put them to good use? I woke Sunday morning feeling better than I really should (thanks Alka Seltzer XS) to find it raining after 2 days of glorious sunshine. 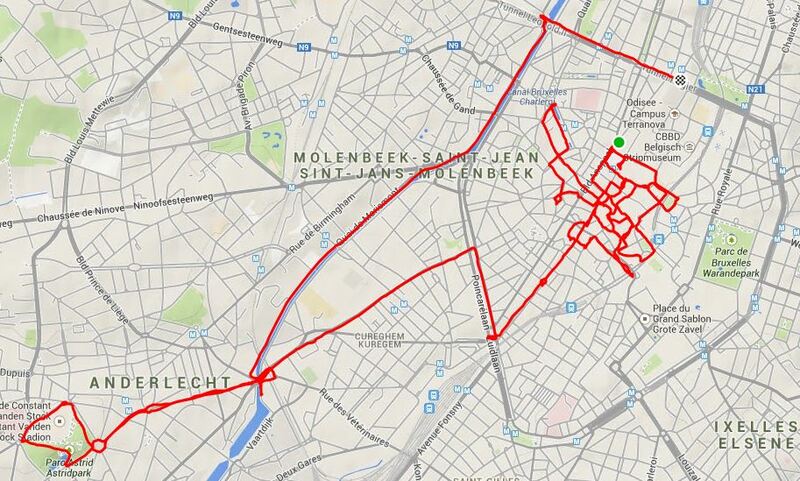 Brussels had banned cars from the city centre for the day and there was free public transport. Though not a typical day it would be a good time to try out a hire bike on quieter streets. 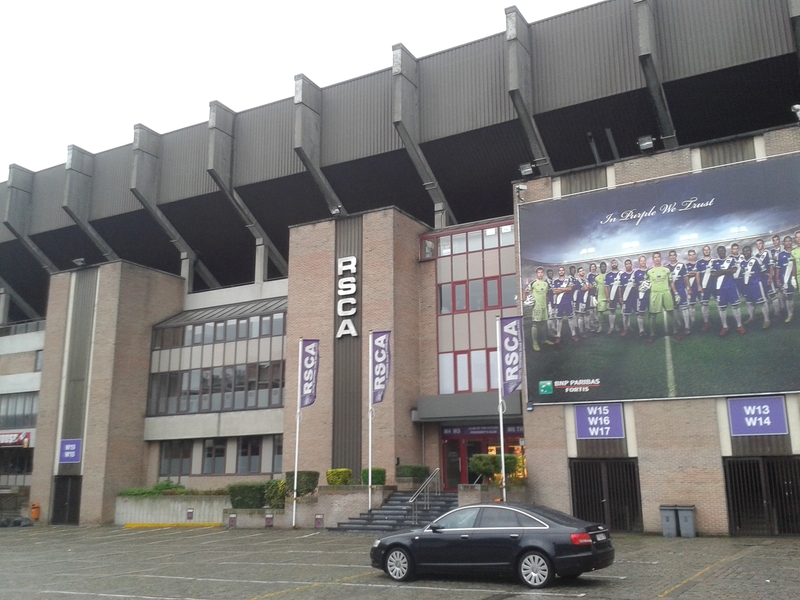 I’d found the national stadium at Heysel whilst running the previous morning. Maybe I could find Anderlecht today? It’s good to have a purpose to your pootling about although inevitably I wasn’t pootling. Similar to the other 2 bikes but blessed with 7 rather than just the 3 gears in London and Paris this was definitely an advantage. The brakes didn’t do much and really I should have swapped the bike for another one but the centre isn’t too hilly and there should be less reasons to stop suddenly on the quieter streets. Navigating the cobbles around the narrow lanes close to the Grand Place was a bit tricky and heavy rain had made them extra slippy. 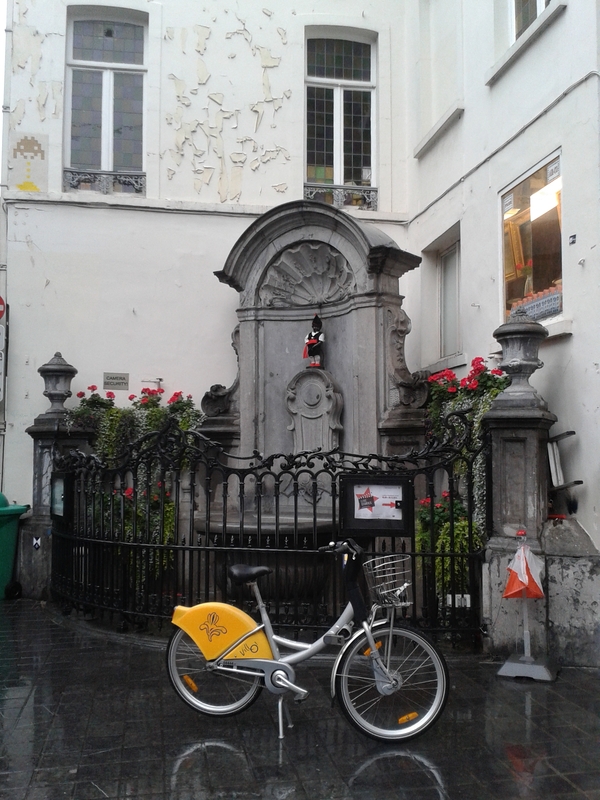 I enjoyed an hour’s pottering around, joining up the dots between the bars we’d done in the previous 48 hours, admiring street art and searching for the Manneken Pis. My confidence was growing with bike’s gears and brakes and my Strava trace shows I made it up a short category 4 climb and hit a top speed of just under 30 mph coming down it. Most of it looks like the work of one of those drug fueled spiders but I promise you I wasn’t lost or confused, I was just taking in the early morning atmosphere. The rain had eased off and I’d got my bearings, Google Maps was suggesting I was on the right side of town to find RSC Anderlecht. This was gradually uphill and whilst the cobbles had gone there were tram tracks to watch out for. I struggled with some of the wide junctions where there was sometimes separation of buses and didn’t know where my bike should be. There seemed to be a lack of road signs at junctions. Sometimes there were bike lanes painted and there were lots of one way streets where you could go the other way by bike. I was glad it was quiet because I must have made a few mistakes and this wasn’t due to beer anymore. I found the stadium in a leafier part of the city and it was worth the effort of finding. I turned to head back into the centre and this is when I started to struggle. I had a couple of hours before checking out of my hotel but didn’t want to be on the last minute so picked up the pace to find I had a noticeable headwind and then the rain returned heavier than before. The big canal would lead me back towards my hotel and after 22km of riding I was happy to park the bike up. Just before doing so I was invited to breakfast with some cyclists and campaigners from Ayay! who were canvassing ideas to make cyclists more visible. Their idea of a teddy bear or a Seasame Street Muppet on a child seat is sweet. I told them how hi viz and helmets are the norm in Britain for commuter/utility cyclists when they didn’t seem to be over there but that gear makes cycling look inherently dangerous when it isn’t *always* so. I feel that Brussels is ahead of us though it’s hard to compare as I didn’t see a working day/rush hour. 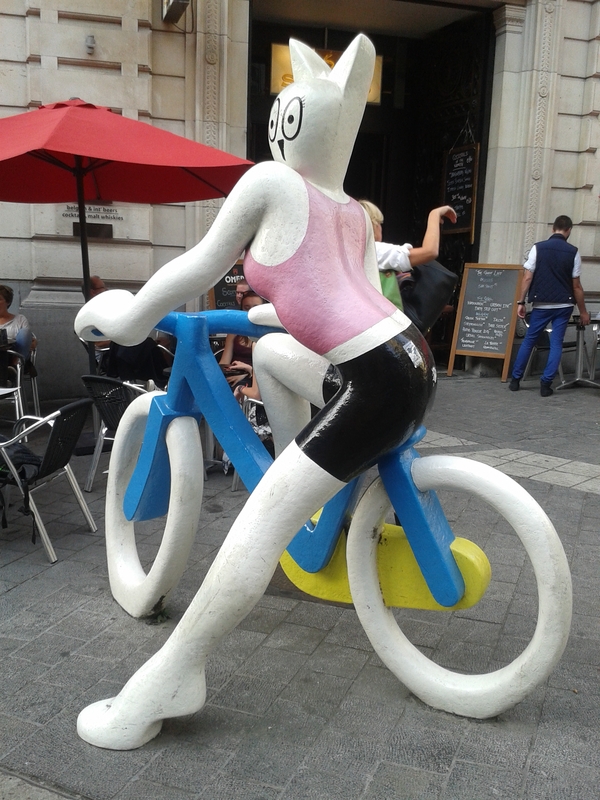 The proportion of women cyclists around Brussels is much higher as was true in Paris 6 years ago and although they’d heard of our capital’s Cycle Superhighways I pointed out that there had been fatalities on these routes and wasn’t sure they were always the answer. We need more than paint. 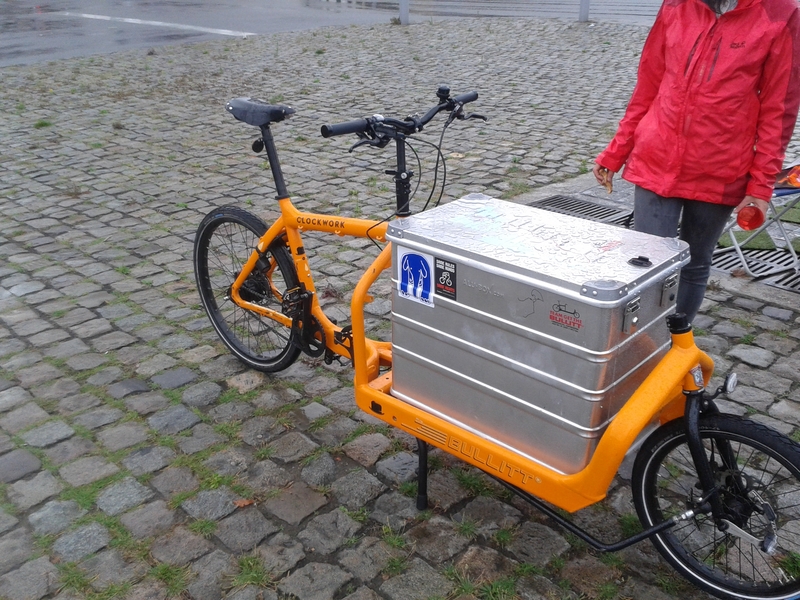 Among the cyclists was a guy called Stijn Wens with a mighty impressive Larry Vs Harry Bullitt cargo bike. He’d bought it in Copenhagen and cycled it 1000 km back home to Antwerp. I saw another later in the day adapted to carry a couple of children. So on reflection the Villo bike was good, better than the other two but maybe the environment was more challenging. As before I took the bike way past what it was designed to do and my back was aching with the effort I’d put into my 2 hours of riding. The hire terminal was easy to use and availability was better than Paris I only really struggled with the maps on the terminal but again I was travelling further than I should have been. It cost €7:50 but would have been cheaper if I’d returned it before I’d chatted over a coffee and croissant. 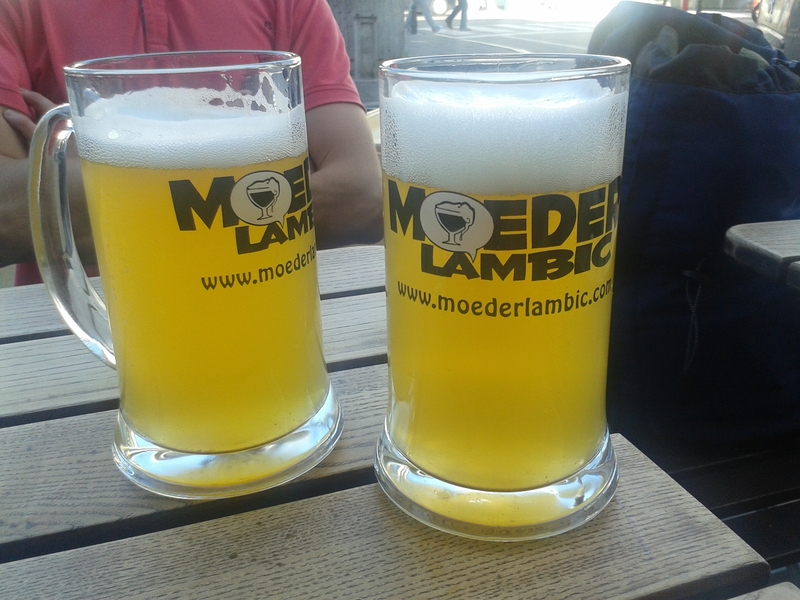 The best beers and good bikes, Brussels is a place I love.